Don't you just love a cupcake that is a bit different? These marshmallow topped and filled cupcakes are just delightful. My kids are going to love them when they eventually get their hands on them. There are a couple of steps in this recipe but there is nothing difficult about it at all. These would make a lovely addition to a birthday party table. This recipe makes around 8 good size cupcakes but it will depend on the time of your cupcake liner. 7. 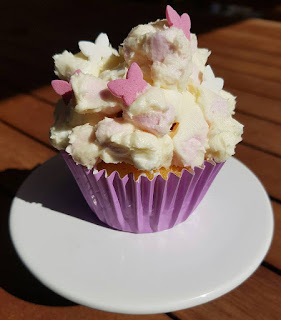 When completely cool, scoop out a teaspoonful of cake from the middle top of each cupcake. 1 teaspoon of unsalted butter. 1. Marshmallows and butter in the jug with the kneading blade. Select Speed 4 for 3 minutes. You made need to scrape marshmallows off the kneading blade if they get caught there. 2. Once the marshmallows are melted to a smooth mixture, place a teaspoonful into the cavity in the top of the cupcakes. 1. Place all ingredients in the jug with the kneading blade. Set Speed 8 for 30 seconds. 2. Scrape down the sides of the jug. Set Speed 8 for 15 seconds. 3. Place marshmallows in the jug. Select Speed 4 for 10 seconds or until marshmallows are combined with buttercream. 4. Pile the buttercream on top of the cupcakes and decorate further with sprinkles etc if you so desire.